For some it’s the almost forgotten holiday. It’s the one sandwiched in between the excitement of Halloween and the hustle & bustle of Christmas. Oh, they’ll make sure to eat some turkey and stuffing on that November date, but they’ve already moved on to the next holiday. Oh, there will be football (I’m in Texas after all) and there will be amazing food, and there might even be a few deals gotten online that evening, but at the heart of it, at the very core, are some of the most precious memories I cling to. You see, Thanksgiving day was the very last time my family was all together before my mom passed away. Oh how I’m so thankful for those memories and family photos. There was laughter. There was football. There were way too many desserts (we celebrated a family birthday too). There was even a little fear (I was a newlywed and this was my first time hosting everyone at our home). Would I burn the turkey? No – but I definitely didn’t put the turkey in the oven as soon as I should have. (Thank goodness I had ordered a pre-cooked turkey for the big day). Mom promised to help me to roast a turkey myself the next Thanksgiving……little did we know that she wouldn’t be able to honor that promise. But here’s the thing……I’ve continued the tradition of hosting my family for Thanksgiving. And though it has changed considerably, and despite a lot of challenges, the holiday gathering has remained something so dear to my heart. There’s nothing like a house full of guests, especially when those guests are family. I imagine my mom smiling down on us each November as we gather and I hope she’s impressed with my turkey skills. I finally learned how to roast that turkey and even make my own giblet gravy. A house full of guests brings so much fun and excitement, but it also takes a lot of prep work. I realized early on that it wasn’t something I could just pull off last minute……there’s always planning that needs to be done. For me, that means LISTS! And I adore LISTS! 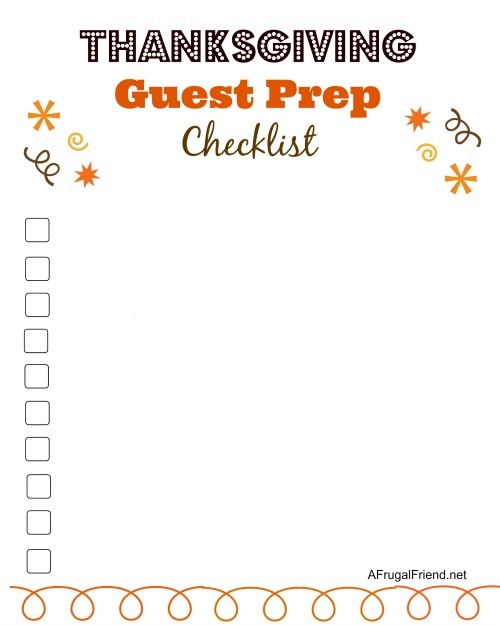 To help, I’ve created a Thanksgiving Guest Prep Checklist – one blank for you to fill out completely and another which I’ve started for you. 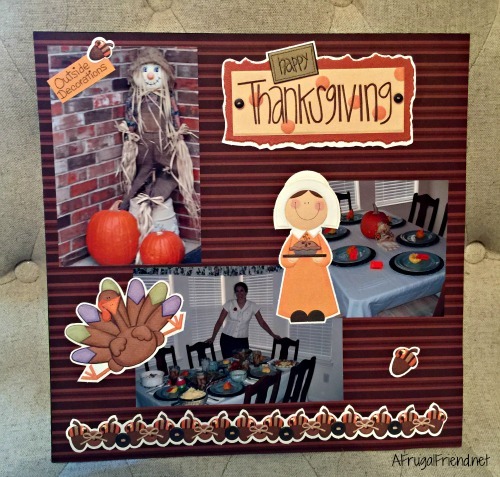 FREE PRINTABLES (ABOVE) –>Free Thanksgiving Checklist Printable and Free Thanksgiving Checklist Printable with Suggestions! 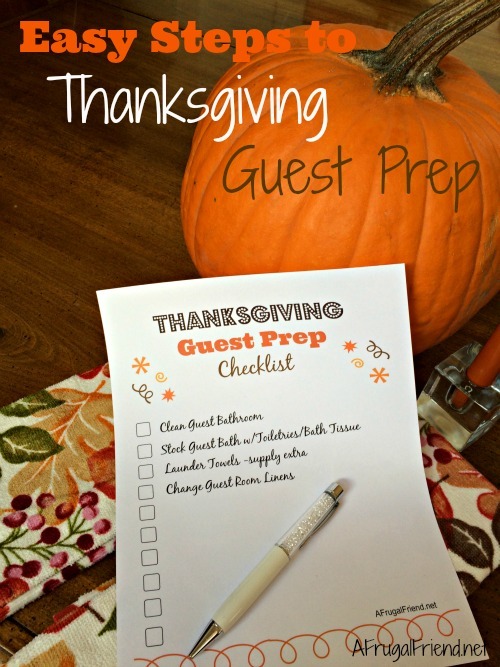 Now let’s talk about the Easy Steps to Thanksgiving Guest Prep! Timing – By invitation, I don’t mean that you have to send a formal (or even a casual) invite to family and friends. What I’m talking about here is making sure your invitation is extended in plenty of time so that everyone can plan accordingly. If you usually host the holiday and this year are planning on taking a trip to the Caribbean instead, let everyone know well before November. Clear – Make it clear if you are offering a stay at your home or just Thanksgiving dinner. Sometimes these little things can be easily misconstrued. Let’s prepare and make the guest room cozy. This is where your prep will make the most impact with your guests. There is one overriding theme here (based on my own experience as a guest) – overstock! There’s nothing worse than having to “search” through someone else’s bathroom for items. 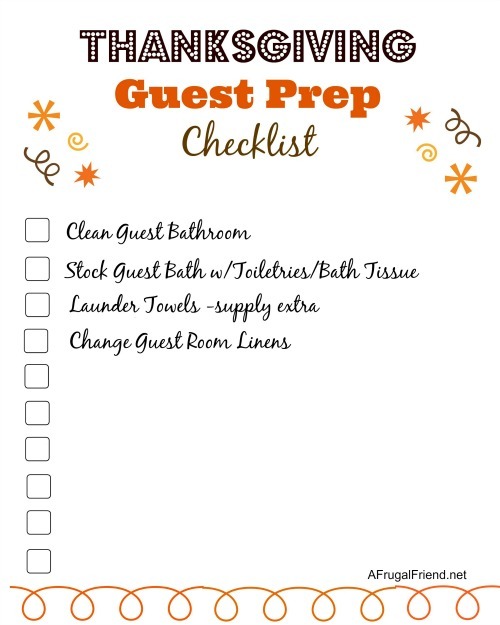 Stock Towels and show guests where they are – remember to have 1 bath towel per guest and at least 1 washcloth per guest, per day. Guests can feel uncomfortable speaking up asking for additional. 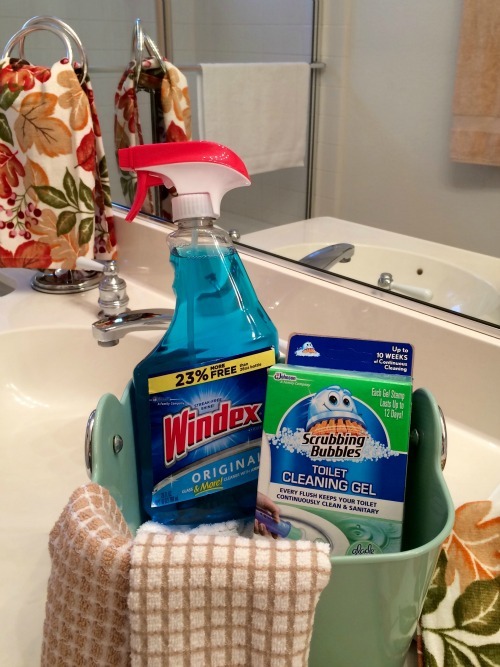 Clean Bathroom Vanity and any Mirrors – my favorite go-to product for this is always Windex® Original Glass Cleaner. TIP: If you are pressed for time and need a speedier option, choose Windex® Original Glass Wipes. Clean Toilet – not my favorite job in the world but made tons easier thanks to Scrubbing Bubbles® Toilet Cleaning Gel. Clean Shower and/or Bathtub – Remember not to forget the bathtub (especially if kids are visiting). My go-to helper here is always Disinfectant Scrubbing Bubbles® Bathroom Cleaner. Stock OverStock and ReStock Bath Tissue – this is the one thing you don’t want to forget! 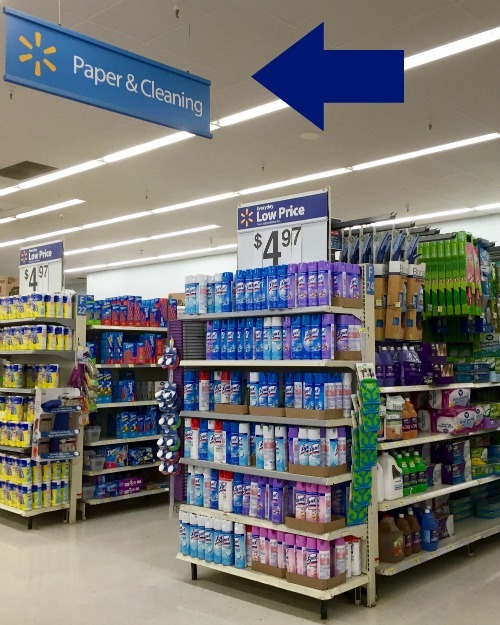 Windex® and Scrubbing Bubbles® are staples in bathroom cleaning for my family and are easily found at your local Walmart in the “Paper and Cleaning Aisle”. Since creating family memories are so important, SC Johnson is celebrating and giving many the opportunity to win a $1000 Rewards Card towards a trip home! Enter at ThanksGathering now → http://cbi.as/xd0m. Be sure to visit http://cbi.as/xd0c and also preserve your Thanksgiving memories with this Walmart offer → http://cbi.as/xd0q and with a qualifying SC Johnson purchase, get a $5 Virtual Prepaid Card! 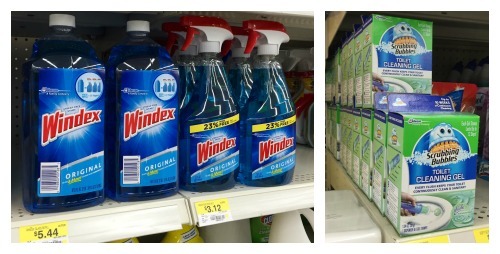 Be sure to follow Windex® on Twitter and on Facebook and also follow Scrubbing Bubbles® on Twitter and on Facebook! So….tell me, who would you want to win a $1000 Rewards Card towards a trip home? Would you go somewhere? Or would you bring someone to your home for the holidays? Great ideas to make sure Thanksgiving is perfect without any mishaps. Wishing you good Thanksgiving memories for the future to mix with your precious memories from the past. I love the checklist you made! I get overwhelmed trying to figure out what all I need to do. Thanks Pam…..it is easy to get overwhelmed when you are the hostess, isn’t it? This kinda makes me feel guilty about skipping Thanksgiving with my family this year! I am going to join a friend and her family for Thanksgiving in Germany to do something totally different. Now I feel bad for leaving my mom to handle all of the prep on her own! Oh no, don’t feel bad Jenn. Actually it turns out that with my broken foot this year, I’m not going to be hosting. I’m taking the year off myself. You gotta do what you gotta do. And Thanksgiving in Germany sounds like amazing memories! 🙂 Enjoy! These are great tips and I love the lists you shared, that I can print to prepare for Thanksgiving! These are some awesome tips and I absolutely love your list. Thanks for sharing!